Hotspot Shield is a premium VPN application and is a popular one among iOS, Android, Mac, and Windows users. The software supports users by enabling them to access regional or geo-locked content for a more open internet. With Hotspot Shield, users also enjoy complete privacy and security. The VPN’s protocols are integrated by large security companies all over the world and have bypassed innumerable security audits. That is why users can rest assured that not only are they anonymous on the web, their personal data are also covered by high-grade encryption. Hotspot Shield also promises its users top-tier performance. The application has numerous servers across the globe that serve to provide people with thousands of IP addresses for complete anonymity. Schools, libraries, and places of employment usually place restrictions on certain websites like Twitter, Facebook, and YouTube. With Hotspot Shield VPN, they are able to enjoy these websites and more since the app bypasses such filters and firewalls. Hotspot Shield creates walls around the user to protect their identity. Because of such encryptions, conducting online activities is more private and secure since users no longer have to fear being tracked or snooped on by their ISPs, employers, and governments as well as hackers. Hackers and malicious individuals or institutions use people’s IP address to monitor how they use the internet. On top of that, they can employ tactics via the IP address to gain information about credit cards, bank accounts, and more. By having Hotspot Shield enabled, users can mask their IP addresses by choosing a different or remote location provided by the VPN’s servers. With Hotspot Shield, users enjoy boosted security online. Whenever they access the internet through the VPN, they can rest assured that personal data, including online accounts and passwords, are strongly encrypted. Whenever a user is on a public hotspot or unsecured network, the VPN app ensures that there are no snoopers or attackers looking on the user’s computer or online activities. Aside from its robust VPN security features, Hotspot Shield also protects its users against malware. It does this by monitoring a website a user visits and ensuring they contain no malware. If they do, the app blocks it to double the user’s protection and prevent them from infecting computers and mobile devices. If you are interested in Hotspot Shield it might also be a good idea to examine other subcategories of Best VPN Services collected in our database of B2B software reviews. It is important to keep in mind that almost no app in the VPN Services category is going to be an ideal solution able to fulfill all the requirements of various business types, sizes and industries. It may be a good idea to read a few Hotspot Shield reviews first as some services might dominate exclusively in a very small group of applications or be designed with a really specific type of industry in mind. Others may function with an idea of being simple and intuitive and as a result lack advanced features needed by more experienced users. There are also services that cater to a large group of customers and give you a rich feature base, but that frequently comes at a higher price of such a software. Be certain that you're aware of your requirements so that you get a solution that offers all the features you search for. How Much Does Hotspot Shield Cost? We realize that when you make a decision to buy VPN Services it’s important not only to see how experts evaluate it in their reviews, but also to find out if the real people and companies that buy it are actually satisfied with the product. That’s why we’ve created our behavior-based Customer Satisfaction Algorithm™ that gathers customer reviews, comments and Hotspot Shield reviews across a wide range of social media sites. The data is then presented in an easy to digest form showing how many people had positive and negative experience with Hotspot Shield. With that information at hand you should be equipped to make an informed buying decision that you won’t regret. What are Hotspot Shield pricing details? 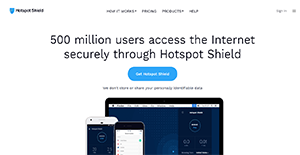 What integrations are available for Hotspot Shield? Pros: Latency, speed and connectivity all work as promised. I get to stream hundreds of videos wherever I am and use different devices that adds to my convenience. You’re allowed to connect to up to 5 devices. I have my laptop at home, my phone when traveling and my office PC. Very flexible to continue what you’re watching from different devices without worrying if someone’s snooping. Cons: It has US servers and may be prone to federal investigation. Pros: It has 90 server locations and 200 servers. You’re always connected to the nearest available spot, so you don’t experience noticeable streaming gaps. The VPN also compresses data that makes it faster to stream, download and upload. Cons: They were accused of injecting ad trackers, but the FTC has yet to confirm this. If you need more information about Hotspot Shield or you simply have a question let us know what you need and we’ll forward your request directly to the vendor.